In a 2012 interview with Karen Davila, Foreign Affairs Secretary Albert del Rosario cited two reasons why the Philippines initiated UNCLOS arbitral proceedings against China. First was because China harasses our fishermen in Scarborough Shoal. Second was because of China’s construction activities on Panatag Shoal [TP: Dear Karen]. What the two of them conveniently failed to mentioned was a key event that happened in March 2011. 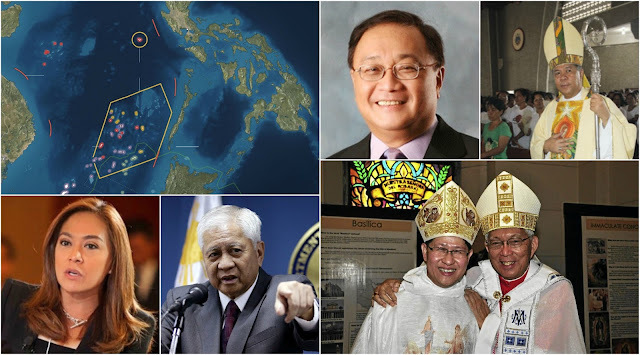 On 02 March 2011 and with national government approval, Manny Pangilinan (MVP)’s Forum Energy sent seismic survey ships to Reed Bank in search of hydrocarbons. Chinese Patrol boats aggressively approached Forum Energy’s MV Voyager Veritas [Storey 2011], sending a clear message that the Chinese Government isn’t happy with what MVP is doing. Reed Bank is part of the disputed South China Sea territory. Instead of speaking with the Chinese to clarify the issue, newly-installed DFA Secretary Albert del Rosario cleared Forum Energy, allowing the latter to complete the seismic survey three weeks later on 23 March 2011 [ABS]. Look at what happened just a couple of days after the July 12 arbitration ruling, Philex Petroleum Corp. said it's awaiting the cue from the Duterte administration regarding its oil exploration activities in the West Philippine Sea [GMA]. Hindi naman sila excited masyado, no? Mas nauna pang interviewhin si MVP kaysa sa mga mangingisda. Hindi ba’t sabi ni del Rosario e mangingisda kuno ang dahilan kaya may UNCLOS arbitration? Harassment of fishermen and Chinese construction activities are annoying, but do Davila and del Rosario seriously want us to believe that Forum Energy’s exploration activities have nothing to do with Aquino’s decision to initiate UNCLOS proceedings? "Carpio was part of the legal team that made the case in The Hague and said a big factor in the Philippines' decision to pursue arbitration in 2013 was China's obstructions around Reed Bank." UK-Based Forum Energy is controlled by Philex Petroleum [MT], as the latter owns 67 percent of Forum’s shares. Philex even plans to buy out the remaining shares to gain 100 percent ownership [BW]. In short, Forum Energy is essentially Philex Petroleum. Now, let’s take a look at important dates vis-à-vis Philex Petroleum’s stock price performance since its introduction in September 2011 [Bloomberg] at P5.70 per share. Down to P25.75 from P32.90 a week before. This was when China deployed tested an oil rig in the South China Sea [Reuters]. China and Philippines also pulled back, agreed on temporarily keeping the status quo [CSM]. Up 12.50 from P 25.30 a month before, 30.40 two months before. This was when China sent ships to Ayungin Shoal [Star] and three Chinese ships reportedly patrolled the Spratlys [Diplomat]. Opened 2014 at 8.20, closed 2014 at 5.04, this was when China started reclaiming land on Fiery Cross Reef. Let's take a look at how Kagitingan Reef (Fiery Cross Reef) changed throughout the past decade. Well, nothing substantial really happened in this year. Same old dispute, no new developments. Note, however, that P2.00 per share is a far cry from its initial 2011 price of over P 5 a share. Yes, things aren't looking good for Philex. Philex Petroleum's 1-year Stock Price Performance from July 2015 to July 2016 (Bloomberg). Share prices started rising in May, in anticipation of the PCA Ruling. Stock prices rose to P 4.70 from 3.92 from end-of-June. This was when everyone was expecting a favorable UNCLOS decision. Stocks rose to P 5.38 from P 4.70 the day before after PCA released favorable ruling [TP: Yasay’s Face]. Ruling was released in the afternoon of 12 July so markets had no time to react the day before. Philex Petroleum's 1-month Stock Price Performance from 2011 to 2016 (Bloomberg). A quick rise on 13 July was negated by a quick fall a day later. Buwisit daw kasi si Yasay. Stocks fell to P 4.68 from P 5.38 the day before, as government took a cautious approach in light of the PCA ruling [NYTimes]. Yes, Duterte and Yasay were party poopers. Today, PXP is at P 4.39, basically stabilizing at the P4.40-s level. "Aside from Karen Davila [TP: Dear Karen], who may stand to benefit from Philex Petroleum's Performance?" ThinkingPinoy feels it’s the right time to list down the major personalities involved in this Reed Bank mess. Specifically, ThinkingPinoy will take a closer look at MVP’s organization and see who stands to gain in Philex Petroleum’s “successful operations”. Asia Link BV (7%) - a First Pacific subsidiary [ABS]. This is the Salim-MVP part. Why would our own Social Security System (SSS) invest in risky stocks? Did the 6-million-per-year nepotism beneficiary Antonino have something do with this? But more importantly, what is PCD Nominee Corporation? The PCD Nominee Corporation is the entity that serves as a central “holder of stocks” traded in the Philippine Stock Exchange. It basically serves as the “swimming pool of stocks” in the PSE. The PCD Nominee Corporation is used by a large number of publicly-listed companies to hide the names of its beneficial stockholders. PCD is used para magtago ng pangalan ng mga kasangkot sa venture [MT]. Just taking a look at the list in the previous section. PCD “owns” 82 percent of Philex Petroleum, yet it’s MVP (Asia Link with just 7 percent) who controls the company. Why? Because even some of Asia Link BV’s shares are inside the PCD chunk of stocks. Thus, when we check the list of Top 100 Stockholders, we cannot just say, “He owns only 0.01 percent so he isn’t as liable”, because the majority of that person’s share may be under PCD. Aside from MVP and SSS, who else owns Philex Petroleum? Manny V. Pangilinan (MVP) in his personal capacity. One primary way stockholders earn income is through annual dividend payments, which is usually a fixed amount per share of stock held [Investopedia]. For example, if the dividend payment is 2 pesos per share, that means a person who holds 100 shares of stock will receive 200 pesos as dividends. Dividends may also be paid not in cash but in company stock. That’s what Philex Petroleum sister company Philex Mining did this year. Specifically, Philex Mining will give 17 Philex Petroleum shares for every 100 Philex Mining shares, paid out on 15 July 2016 or just last week [PSE]. Now, who are the major stockholders of Philex Mining? The Roman Catholic Archdiocese of Manila used to be Philex Mining’s 15th largest stockholder [GMA], but it said it divested its shares by September 2014 [Rap] after it discovered irregularities in Philex Mining business practices. The problem, however, is that it seems to have diverted the proceeds to Philex Petroleum, a sister company.